Without question, one of the most agriculturally intensive regions in the United States is that of the Central Valley in California. What sets it apart from other such areas is its sheer vastness, about 18,000 square miles. I recently spent a few days in the valley, traversing from Sacramento to south of Tulare. I’ve been in the region previously but never in the summer. Dairy farms, of which there are many, have nut trees growing right up to the farmstead. Interspersed between the nut tree fields are corn and alfalfa. Dairy producer or not, seemingly everyone has nut trees. 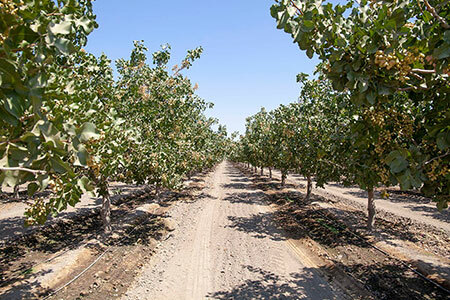 While talking nuts with several farmers and ranchers, I heard “good nut land” was fetching anywhere from $25,000 to nearly $50,000 per acre depending on location. To be sure, nut acres are replacing forage acres and that trend is showing no signs of slowing down. The nut trees also put dairy producers in an interesting position. They supply both milk and almonds to the marketplace. These two commodities are currently at odds in the grocery store dairy case. The success of farmers in the Central Valley hinges on available water. The region is generally hot and dry in the summer; this summer was especially so with the city of Fresno only having three July days that didn’t register 100°F. Needing water for their mostly flood-irrigated crops is not different than many other parts of the West except that California has a long coastline of large cities that are jammed full of people who also require, and in many cases, demand water. Most of the decision makers in the state are from these coastline cities, and this makes competition for water rights a major issue in the Central Valley, which sits between the major sources and the coast. Following some severe drought years, water is neither cheap nor plentiful by most standards. Through the years, perhaps no state has done a worse job of managing their water resources than California. As a result, the chickens have come home to roost. Unfortunately, those who live west of the coastal mountains often silence (or ignore) agriculture’s voice in the state. The Central Valley is a forage-producing machine; it has to be to feed the number of dairy cows that call it home. Tulare and Merced top the list of largest U.S. dairy counties. Several others in the valley are not far behind. Most of the alfalfa is baled and either used by dairies or shipped to export markets. Often, six to eight cuttings are taken per season. The hot temperatures make it difficult to harvest high-digestibility forage in the summer, but these cuttings can be diverted to other uses. Even with the hot, dry weather, it’s not unusual for hay to lie in the field for nearly a week after it is cut and before baling. Alfalfa feeding to milk cows is currently at an all-time low. This is mostly due to poor milk prices coupled with higher hay prices of late. The single-crop corn silage harvest was wrapping up last week and farms were starting on their double-crop silage. It’s typical for dairies to grow wheat or triticale during the winter, harvest it for silage in the spring, and then plant corn for silage. The corn silage fields that I was in were yielding 35 to 40 tons per acre. 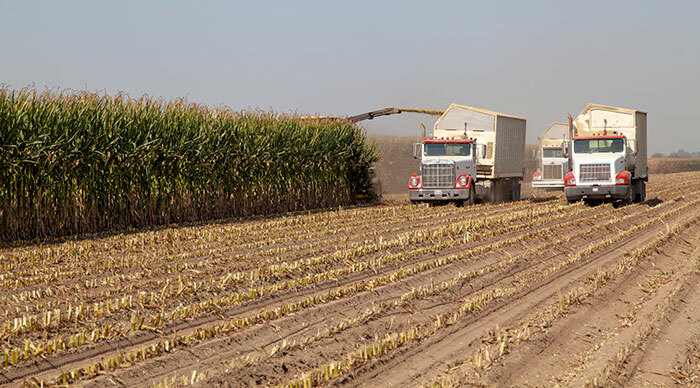 Harvesting corn silage in the Central Valley is unlike conditions encountered in the East and Midwest. The hot and dusty conditions, coupled with the high yields, puts a strain on forage choppers. For this reason, most forage harvester manufacturers do a lot of field testing in the Central Valley before a new machine line is marketed. “It’s crazy and makes absolutely no sense,” said one veteran custom forage harvester I talked to in the Tulare area. He was referring to the fact that corn silage in that area is always blown to the left when it is being harvested. He explained that silage trucks need to be covered, and years ago the permanent covers were always open to the right (see photo above). “It defies all logic now because the controls and monitors are on the right side of the harvester cab, making the operator turn his head back and forth all day,” the perplexed custom operator said. “Some traditions die hard,” he added.